Review: To be honest, I was skeptical of this book’s self-proclaimed status as “Japanese steampunk.”* Still, I decided to give it chance because I love griffins and the book blurb promised me griffins. 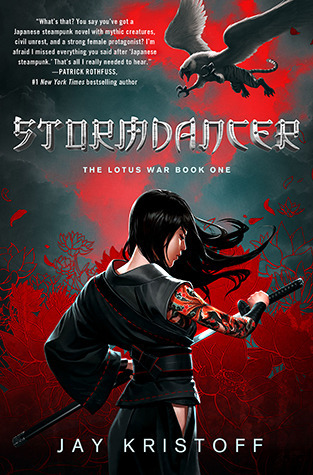 Sadly, my skepticism and doubts were not unfounded — Stormdancer’s use of Japanese culture as a convenient exotic setting was off-putting, to say the least. Unfortunately, the book’s casual treatment of Japan as an exotic fantasy backdrop prevented me from enjoying the story. This ranges from the generic Asian-y atmosphere of the book to the offensively cavalier use of Japanese culture. In addition, Japanese words are misused and mistranslated in both the text and the glossary. Throughout the book, there’s a strong sense of cultural appropriation and shallow, careless research. As the saying goes, it takes a village to raise a child. Well, I believe this saying also applies to books. When it came to creating a book that respects the culture it uses as its setting, this village fell down on the job. *Steampunk set in shogunate Japan is sort of like setting steampunk in medieval England instead of Victorian England. Um, what? Thank you for taking the bullet and reading this. I had heard the same criticisms you made about the book as well, which saddened me greatly. The writer completely failed in doing something that could have been epic. Argh, yeah, I feel like I would’ve loved this type of novel (griffins FTW) but that kind of cultural appropriation is just impossible to take. From what I’ve heard & read, the language is mangled so badly that it defies belief. Glad to have you reinforce my decision to pass on this one!